When the weather broke, the windows opened. All that fresh air blowing things from North to South in the house also brought in with it the sounds of the city. On a quiet night, not that we get too many of those, I can hear traffic from the highways at least a mile away. All part of living in the city. I've grown used to that, and accounting for it when I've got on my music. If it gets too loud, I have mom standing over my shoulder screaming at me to turn it down. Mom in this case is a parrot. My Orange Wing Amazon, Oscar. 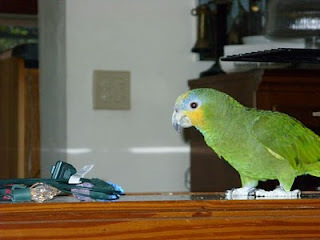 A couple weekends back, I set him out on the front porch and let him chatter with the feral parrot flocks we get here. He ducked and covered when one of the hawks got a bit too close, but for the most part he enjoyed the change of pace. So did we. I was able to fill the room with some music I really wanted to experience. Headphones off, speakers turned up more than Oscar would allow. He gets to visit the Ring Necks and the feral birds, I get to play Beethoven, Armin van Buuren, and Earth Wind and Fire. Early in that morning, it was cold. 70F, that's 21C for the Metrically Endowed. Yeah, it's Florida and we actually look forward to those first mornings before the sun is fully up and the temps dip down below room temp. Saves money and wakes up everyone. We threw open the windows. I think that was a mistake. It wasn't even 6AM when Oscar started chattering at Boogie Wonderland played on the radio at low volume in the kitchen. I don't think it was the Emotions and Phillip Bailey that he was singing with. I think it was the Peterbilts and Kenworths on I95 on the other end of town coupled with the rest of the waking world. I shrugged and got him to quiet down. There is a big blue throw blanket that I keep on hand to cover the cage. All I have to do is show it to him and ask him if he wants some time out. So much for running any loud appliances, I lowered the volume on everything in the house, vowed to wait until after 7AM to roast my coffee, and let Oscar have his way. He likes the music just like I do but I really don't want his accompaniment, and I'm sure the rest of the sleeping island doesn't either. The music got paused for a later time. I had to bring him in shortly thereafter anyway. As the city woke up, the trucks started moving around and the morning gardeners moved into position. A herd of migratory lawnmowers began to fire up and feed on the St. Augustine Grass and errant Hibiscus that needed to be trimmed. Life in the suburbs can be a loud place for a small green bird.